The Dyson Airblade AB09 faucet hand dryer dries hands hygienically in just 14 seconds! The AB09 Dyson faucet dryer comes in the 110-127V low voltage 301848-01 or high voltage 208-240v 301841-01, and has been revolutionized with the new high speed V4 Dyson digital motor. Prior to specifying electrical voltages, the AB09 Dyson Airblade hand dryer was also known as model number 25992-01. The AB09 Dyson faucet dryer is a revolution in hand drying technology allowing for the user to wash and dry hands at the sink. The AB09 Airblade hand dryer is the short Tap. After washing your hands, you can dry them while staying in the same place. The AB09 Short Tap Dyson faucet dryer features the high speed V4 digital motor from Dyson and can dry hands in 14 seconds. The Tap is constructed from brushed stainless steel and comes with a 5 year parts and limited labor warranty. The Dyson AB09 Airblade Tap hand dryer and faucet combo is compatible with most types of sinks. 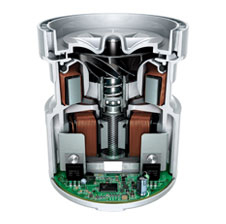 The Dyson digital motor V4 was seven years in the making – it is one of the world's smallest fully-integrated 1400W motors. It is the only hand dryer motor powerful enough to draw in 28 liters of air a second through a HEPA filter and then dry hands in 12 seconds. Get Free Shipping on the Dyson Airblade AB09 Tap hand dryer and all orders over $155. Select "Free Shipping" at checkout. Sent via UPS Ground. US Domestic orders only. Need it sooner? Other options are also available.